Dani Pedrosa won his first MotoGP race for 12 months in dominant fashion at the Sachsenring in Germany today to revitalise his MotoGP world title aspirations. 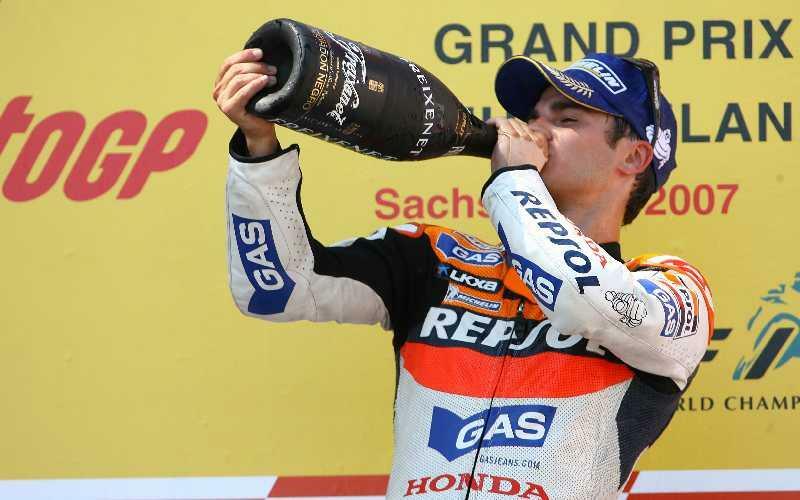 In searing heat, Dani Pedrosa was ice cool to finish a massive 13.166s clear of closest rival Loris Capirossi as the Spaniard ended a losing streak that stretched back to the 2006 British MotoGP at Donington Park. Dani Pedrosa’s winning margin was the biggest victory in a dry four-stroke MotoGP race since rules changed in 2002. Pedrosa grabbed the holeshot and looked rarely troubled as he pulled away from MotoGP world championship leader Casey Stoner with ease. The Australian was one of several Bridgestone riders to be seriously hampered by rear grip issues with track temperatures hitting close to 50 degrees this afternoon. It was the first victory for Honda’s official factory team for nearly a year, with the Repsol squad winless since Nicky Hayden’s 2006 Laguna Seca success. And Dani Pedrosa’s third premier class win saw him close the gap on fifth placed Stoner to 52-points. But with Valentino Rossi’s rare blunder when he crashed out on lap six, he is now only 20-points behind the Italian in second. “It was very, very good for me. I’m very happy. This result is unbelievable. We did a very good race and I’m happy for my team also. Dani Pedrosa was in a race of his own as Michelin’s rear tyre withstood the extreme track temperature better than rivals Bridgestone, and Pedrosa said he never had any concerns about tyre endurance over the 30-lap race distance. “I was quite confident with the rear tyre because from Friday I felt it was quite good. Maybe the front was not perfect. But I’m very happy for the tyres. I have to say thanks to Michelin. “They gave us very good tyres this time,” added Pedrosa, who said he wasn’t thinking too seriously about being firmly back in the hunt for world title glory after he handed Honda its first victory in the new 800cc era. Despite a much-needed first win for Honda’s heavily criticised new RC212V contender, Dani Pedrosa said the V4 still needed to be improved to get more on par with rivals Ducati and Yamaha.